Marine and Programmable Land Mobile Channels The HX380 is factory programmed with all USA, Canadian, International and NOAA Weather channels. 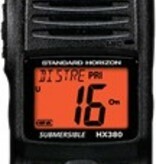 It also has the capability to be programmed with up to 40 Land Mobile Radio (137-174MHz) channels with CTCSS or DCS signaling by a Standard Horizon dealer. Lithium-ion battery and charger The HX380 is packaged with a 1600mAh Lithium-ion battery providing up to 13 hours of operating time on a single charge. Loud speaker audio The HX380 is designed with heavy commercial use in mind, with an internal 700mW speaker, receiving clear radio transmissions in a noisy environment is no longer a problem. Programmable Scan, Priority Scan and Dual Watch Scanning is not an issue with the HX380. The radio can be setup to scan any number of channels with or without a priority channel or simply can be setup to scan between a priority channel and one other channel (dual watch). NOAA Weather Channels and Weather Alert 10 NOAA and Canadian Weather channels are pre-programmed and easily selectable using the dedicated WX key. In addition, the HX380 can be set to monitor WX channels and provide an audible alert to inform of pending storm advisories. 3-Year Waterproof Warranty Because the HX380 is built better, it’s backed better. If your Standard Horizon HX380 ever fails for any reason including water damage during normal use in the first three years, STANDARD HORIZON will repair or replace it free, without hassle or charges…period! If it fails thereafter in normal use it is covered by Standard Horizon’s Flat Rate Service Program.